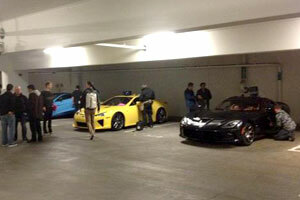 Top Gear Driving a Lexus LFA From Las Vegas to Mexico? The lads from Top Gear arrived in the USA yesterday, landing in Las Vegas for what’s rumored to be a 3,000 mile journey to Mexico for a future episode. Why’s this relevant to Lexus? Jeremy Clarkson will be driving an LFA, with Richard Hammond in a SRT Viper and James May in an Aston Martin Vanquish. Justindmps: OO Schnapps cant wait for this episode to air. Odometer permanently stuck at 999,999.